Poets Speak Truth to Power. Poets have the ability to REACH people in ways no one else can. Suheir Hammad is just such a poet. She is Gifted and she is Driven. and the occupation of Palestine. Suheir Hammad is a Palestinian-American poet, author and political activist who was born on October 1973 in Amman, Jordan to Palestinian refugee parents and immigrated with her family to Brooklyn, New York City when she was five years old. Her parents later moved to Staten Island. I know this is a controversial issue. We must talk about the hard stuff. We must. ~ by Step On a Crack on April 16, 2012.
me two. where did you get this pic? 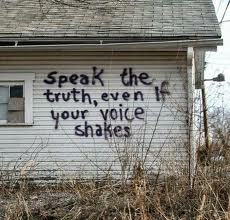 I found it searching images for ‘ speak truth’ and there it was online! I SO want to paint this on MY house! Thank you for being here. I have been out of action mostly and am working my way back. Peace, not hate. Don’t want hate, won’t spread it. Once again, my little bit of internet refuses to allow me to watch, but I love the photo and the message, and you! One day I hope you can watch some of these Slam artists. I think you would LOVE them! I am so happy you use your bits of internet with all of us. Beautiful. Yes, we must speak about the hard stuff. So true, we must be the change we want to see in the world, as Gandhi said. We have so much to learn from one another and dialogue must be opened in a non-judgmental environment. Thank you for the TAG! I have been ‘absent’ here of late and look forward to catching up. I LOVE that quote by Gandhi! It is one of the most powerful quotes I have ever read. I agree; if we can learn to listen to one another we are so much closer to Peace; both within and without. Peace and Love to you my Friend! You’re so very welcome, feel free to play if you wish, and if not, no worries there too. It’ is a busy time of the year with weather changing (in some places, LOL!) and the outdoors are calling. Isn’t she incredible! I love so many of the slam artists. I love their presentation and their words. They move me. I am lucky to live in a lively Slam town….